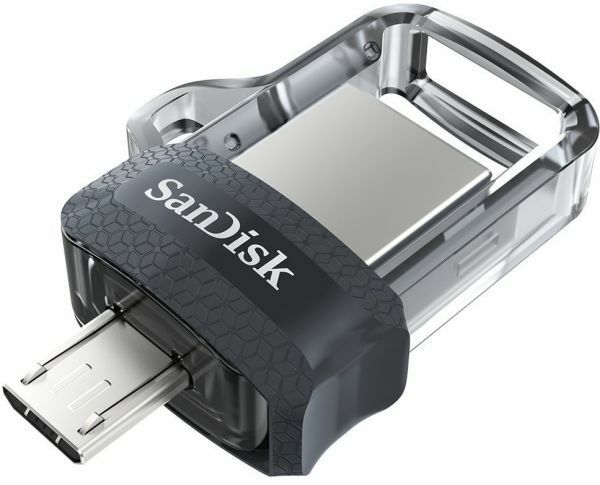 The SanDisk Ultra Dual Drive m3.0 makes it easy to transfer content from your phone to your computer. With a micro-USB connector on one end and a USB 3.0 connector on the other, the drive lets you move content easily between your devicesfrom your Android smartphone or tablet to your laptop, PC or Mac computer. The USB 3.0 connector is high-performance and backward-compatible with USB 2.0 ports. The SanDisk Memory Zone app for Android (available on Google Play) helps you manage your device’s memory and your content. The SanDisk Ultra Dual Drive m3.0 makes it easy to transfer content from your phone to your computer. With a micro-USB connector on one end and a USB 3.0 connector on the other, the drive lets you move content easily between your devicesfrom your Android smartphone or tablet to your laptop, PC or Mac computer. The USB 3.0 connector is high-performance and backward-compatible with USB 2.0 ports. The SanDisk Memory Zone app for Android (available on Google Play) helps you manage your device’s memory and your content. Available from the Google Play store, the SanDisk Memory Zone app lets you view, access, and back up all the files from your phone's memory in one location. It can also automatically move files from your device to your drive to free up space.